They compete for the same students. Both have long traditions of academic excellence. But one of those schools is trying hard to close the gap between rich and poor in American society—and paying a high price for its effort. The other is making that problem worse—and reaping rewards as a result. His logic is pretty straight forward: Schools have a budget constraint, and at the margin they can spend an additional dollar on financial aid or on campus amenities. A school that invests in campus amenities will draw more students willing to pay a premium price, whereas a school that skimps (relatively speaking) on amenities in favor of financial aid will be at a relative disadvantage in two ways: First, students generally prefer high-quality amenities to low-quality amenities. Second, it generates less revenue per student and therefore fewer resources to put into financial aid or campus amenities. Malcolm Gladwell is an influential writer with best sellers to his credit such as Outliers and The Tipping Point, as well as about a million New Yorker articles, so this pieces is certain to make waves. That he calls the investment in high-end dining services “a moral problem” and implores students not to go to schools with ridiculously good food pretty much ensures people will be up in arms about this. This is also relevant from our perch here at a small liberal arts school with our own financial decisions to make. I was more amused than convinced by the thesis when I first read the abstract, but after looking at the numbers and listening to Gladwell, I am more sympathetic (scroll down the Revisionist History page for the photo of a banana chocolate chip waffles with the school logo emblazoned in the center). Though, I guess that’s why Gladwell is such a popular figure: he makes an interesting claim, tells a good story, and makes a good case. As an aside, I think I speak for most people who attended a residential campus prior to 2000 when I say that the food even at campuses that “skimp” on quality is ridiculously good compared to what we ate (though I did love the Monte Cristo sandwich on Thursdays). You can read more about it at the always lively Inside Higher Ed website. Addendum: It’s probably worth adding that it’s still okay to complain about food at your school. You probably pay a lot of money for dining services, and with that, you expect certain levels of quality, variety, and availability. A quick peek reveals that the average U.S. household (a.k.a., consumer unit) spends about $6,800 annually on food compared with college meal plans that run $2000-$3500 per semester. This view point has been recently propounded by Japanese Prime Minister Shinzo Abe and his protege (puppet?) Haruhiko Kuroda, selected to be in charge of the Bank of Japan. Japan is tired of two decades of stagnation and falling or at least not rising prices. Mr. Abe has pushed for a 2% inflation target and Mr. Kuroda will provide $77 billion worth of monthly bond purchases to achieve that goal. If that’s not enough, will more be forthcoming? Is a little good and more better? Inflation as a cure for economic ills is not new. In fact, check out this 1933 video on the how inflation is good for everything and everyone. Clearly, proponents of Neo-classical macro beg to differ. Those in Econ 320 will have a chance to sort out the winners and losers. Indeed there will be losers, as we know that there is no free lunch. Who will the winners be? Place your bets now or maybe just guard (cover?) your assets. Whatever else you do watch the video? It’s a hoot. 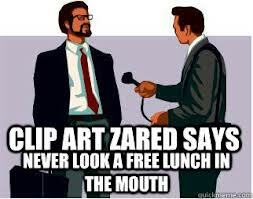 ZIRP: The New Free Lunch? Don’t Bet on It. The Federal Reserve Bank of the US has followed a zero interest rate policy (ZIRP) since fall 2008. It has employed a variety of mechanisms to lower not only overnight loans between banks (the Federal Funds rate – its usual target) but also to lower the entire yield curve. (See the details at the Federal Reserve Bank of St. Louis.) Previous postings here and here have addressed some of the costs of this approach. As a consequence, Japan impeded “creatively destructive” economic activity since “zombie” companies were kept alive by cheap credit that was not available to new entrants. Capital allocation became very distorted; hence, many profitable opportunities were foregone and low return (perhaps even negative return) activities remained in existence. Of course, that was Japan. Not the U.S. That couldn’t happen here, could it? Speaking of things that are “free,” David Lowery, indie rocker and now instructor at the University of Georgia, takes the current generation of music lovers to task for downloading songs on share sites, hence bilking the artists. Here is his rather extensive post on the subject. Hardware: Giant mega corporations. Cool! have some money! Artists: 99.9% lower middle class. Screw you, you greedy bastards! Well, let’s hope it didn’t teach you everything. For more formal treatment of the economics of file sharing, you might head to the link at Stan Liebowitz’s homepage (of Liebowitz and Margolis fame). Professor Liebowitz reviews the literature, which generally shows the significant hit file sharing has delivered too the industry. For some careful details, see “File Sharing: Creative Destruction, or Just Plain Destruction?” in the Journal of Law and Economics. But evidently there is free beer at the VR Tuesday night. There is no such thing as a law in Economics? Could this be the origin of the famous “law” about free lunches? Not likely, based on a quick look at Wikipedia. The history there, confirmed by Google searches of contemporary books, does raise a different question, though: Had Pareto and Schmoller been at a conference in New Orleans rather than Geneva, would they have had to revise their notions of certain economic laws? Because in that case, Schmoller’s answer would have had to be something like: “Why, in just about any public house you can eat for nothing this time of day! Try the one around the corner, they serve oyster stew! All you need to do is buy a drink for fifteen cents.” If the drinks are not overpriced at 15 cents, is the lunch still free? Some sources suggest that the whole “free lunch” custom was, in fact, a relief program, a socially necessary outcome of high unemployment and poverty. This would merit (and require) more than a superficial Google search, so I’ll leave it as an exercise to the interested reader. Is there something funny about this picture? We will hold the Economics TeaBAs this term on Mondays at 4:30 p.m. in Briggs 217. The EconTBA is a great opportunity for you to take a break from your studies to come and chat with your favorite economics professors and students. Last year we had a vibrant guest list, ranging from professors in other departments to visiting speakers to emeritus faculty. And even if you don’t like us, there are always the “free” tea and cookies for you to enjoy. This was formerly called “Economics Tea,” but we decided it was too risky to lock in to one beverage, given potential for changes in prices and income. Hence, Economics TeaBA. Economics Tea with Corry Azzi, Today at 4 p.m. Rumor has it that Professor Azzi will be stopping by for tea and conversation. 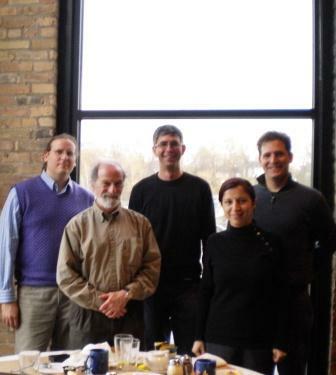 More than likely, “subtle” is one of the last adjectives that springs to mind when a description of economics professor and alumnus Corry Azzi is needed. In a world fashionably attired in grays, Azzi, ’65, prefers going through life dressed to the nines in blacks and whites. Peek beyond the bluster, however, and you will find an award-winning teacher, loyal friend, and most importantly, a nurturing mentor. Don’t Forget the Monday Economics Tea, 4 p.m. Following the success of the inaugural Economics TBA, we will be breaking out the hot beverages and cookies once again this coming Monday at 4 p.m. (Caffeine available upon request). This should work out splendidly for you with classes running until 4:20, as I’m certain that both the water and the conversation will be heated by that point. It’s never too early to think about what you are going to do after you leave Lawrence. In fact, thinking about what you might do after graduation could well open up some exciting opportunities whilst you are still here in the friendly confines of Appleton. A week from Sunday, February 14, St. Valentine’s Day, and the last day of the reading period, 25 alumni will be on campus for the Shine Light, More Light on Your Future conference. I strongly recommend that you seize the opportunity to meet our alumni and discuss their career paths and experiences. They are here because they love Lawrence and want to help folks just like you. Looks like a really solid lineup, including my mentor, Alan Parks! And, there’s probably free food, too. Don’t forget, the Economics Tea kicks off today at 4 p.m. in Briggs 217. “Free” cookies and discussions of maximizing behavior. If you are reading this, presumably your attendance indicates a well-specified objective function, whereas your absence is due to high marginal costs rather than an information problem. If you find that amusing, then this will definitely be your kind of crowd.